A STOCK TANK FLOAT THAT DOES NOT LEAK, TAKE ON WATER, RUST, SINK, ETC. — SHOULD LAST A LIFETIME. Virden Perma-Bilt’s research department has completed lengthy field tests with these encapsulated urethane tank floats. They measure 12″ x 12″ x 2-1/2″ thick. 30 pounds of pressure is required to push this float under water. They will easily connect to your high pressure or low-pressure valves, ensuring positive on and off action. 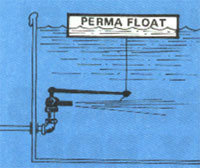 At right is shown the Virden Perma-Float, along with a cutaway piece illustrating the famous PermaBilt urethane foam body, and covered with a 1/8″ steel-hard epoxy covering. The center core hole is also completely sealed water-tight so there is no chance of deterioration. Heavy-duty #4 copper wire goes through float and connects easily to your water valve. The valves shown below are also available through us, or your local hardware dealer. Now, the problem of keeping tank floats in good repair is solved! Thanks to Virden’s encapsulated water-tight Perma-Float, you can now be assured of problem-free tank watering systems. Try them out and see if they aren’t the best you’ve ever seen! Virden Perma-Bilt’s research department has completed lengthy field tests with these encapsulated urethane tank floats. They measure 12″ x 12″ x W thick. 30 pounds of pressure is required to push this float under water. They will easily connect to your high pressure or low-pressure valves, ensuring positive on and off action. 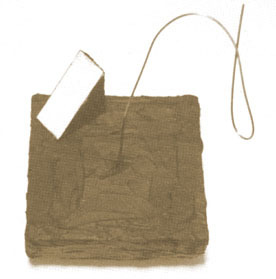 Above is the Virden Perma-Float, along with a cutaway piece illustrating the famous PermaBilt urethane foam body, and covered with a 1/8″ steel-hard epoxy covering. The center core hole is also completely sealed water-tight so there is no chance of deterioration. Heavy-duty #4 copper wire goes through float and connects easily to your water valve. The valves shown below are also available through us, or your local hardware dealer. Now, the problem of keeping tank floats in good repair is solved! Thanks to Virden’s encapsulated water-tight Perma-Float, you can now be assured of problem-free tank watering systems. Try them out and see if they aren’t the best you’ve ever seen!